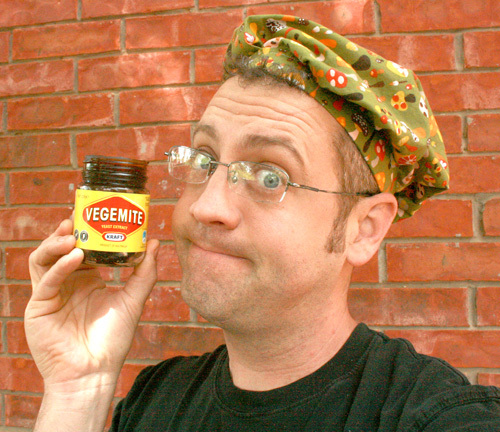 The truth about Vegemite…from an American foodie | Have YOU Ben Starr Struck? Show that same bottle of Vegemite to 10 Australians, and 9 of them will reach for the bottle to open and smell it deeply, and ask if you have any toast. The remaining individual will have hopped on the nearest kangaroo and headed for the Olgas, wanting absolutely nothing to do with the stuff. Why the discrepancy? 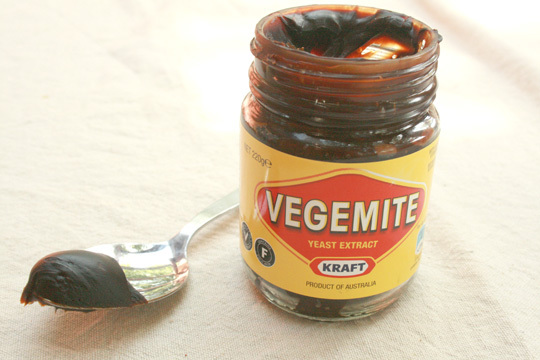 I’ll admit, like many Americans, I was dubious when I was first offered Vegemite…from an Aussie in a youth hostel in frigid Quebec City during Winter Carnaval in 2000. Yeast paste. Sorry, but there’s just nothing in American culinary history that gives us a frame of reference for processing the edibility potential for a yeast paste. So that’s the first thing that Vegemite’s got against it for recruiting an American audience. Then, there’s the smell. It smells like…well…like Vegemite. Like nothing else you’ve ever smelled. As a chef, I now recognize that smell immediately…UMAMI. The complex, meaty smell and flavor that makes up the 5th type of taste that your tastebuds can recognize. (Japanese scientists discovered in 1908 that there are additional taste receptors on the tongue, so not only do you physically taste salty, sweet, bitter, and sour on your tongue like you’re taught in grade school in the US, you also taste umami or “savoriness.”) The reason that dishes in professional restaurants often taste better than the dishes you cook at home is because professional chefs know how to build this type of flavor into their dishes. Those umami receptors on your tongue are responding to glutamates…full, complex, savory, meaty flavors that come from amino acids in meat, mushrooms, and the byproducts of fermentation. That now-infamous ingredient monosodium glutamate was used to improve flavor in many Asian cuisines since the discovery of umami in 1908. My friend Justin loves to tell a story of how, at a boy scout camp out, the boys peeled the label off a multi-chambered bottle of spices and passed it around the campfire to see who could identify each spice within the bottle simply by taste and smell. The clear crystals that looked like salt puzzled everyone, because they just tasted “good.” No one could figure it out until they retrieved the label and discovered that they were eating monosodium glutamate, and their tastebuds were recognizing umami. And that’s what Vegemite smells like. It’s a fairly foreign smell to most Americans who don’t really think to analyze it. And that accounts for the second negative reaction most of them experience…it smells “strange.” Not bad, mind you. It CERTAINLY doesn’t smell bad. But it doesn’t really smell like anything you’ve smelled before, unless you’ve scraped up all the fond from the bottom of a pan after searing meat or mushrooms and just tasted that alone. The third reaction comes after tasting it, which many Americans do on the tip of their finger, rather than the traditional Aussie preparation, which is to spread it thinly on buttered toast. A fingerful of Vegemite is like a meaty, salty punch in the face. But it’s not meant to be tasted this way, just like most people don’t scoop up a fingerful of mustard or horseradish or ketchup. It’s a condiment. It’s to accent flavor, not BE flavor. 3 strikes and you’re out…and most Americans never give Vegemite a second chance. I know I didn’t. After being revolted by my first taste in a youth hostel in Quebec, even after multiple trips to Australia, staying in Aussie homes, and being offered Vegemite sandwiches for breakfast and turning them down, I still insisted that Vegemite was disgusting, despite the fact that an entire continent is enamored with it…despite the fact that multiple other products are as revered in other Western civilization countries like the UK and New Zealand…I insisted that Vegemite was foul and should be destroyed. But…in my new life as a chef, I vow to give EVERYTHING multiple chances to redeem themselves. My own tastes have changed dramatically, both as I age and as I learn. So when I scored some Vegemite yesterday at World Market, I decided to let this product redeem itself in my kitchen. Because, as any chef knows, ANY way to improve efficiency in the flavor-building process is welcome. Pause for a moment and let’s discuss “flavor building.” When a chef “builds” a sauce (whether it’s a pan sauce for garnishing, or a vegetable or meat sauce for pastas) (s)he is carefully crafting layers of flavor. First, the meat goes into a screaming hot pan with some fat, and the outer layer of the meat begins to brown via the Maillard reaction. Bits of the meat stick to the bottom of the pan and essentially “burn,” but all sorts of miraculous conversions are taking place in the amino acids within the meat’s protein cells. Then we add aromatics to the pan, like onions, garlic, or shallots. The sugars within these aromatics begin to darken and caramelize. Then we hit the pan with some wine, and the alcohol unlocks flavor components in the browned meat and onion bits that are not normally soluble in water alone, so now our taste buds can decipher even more complexity in the flavor. But the wine, and additional liquid ingredients like stock or cream, have diluted the flavors, so then we reduce the sauce to concentrate them again. All this effort is done to build flavor, primarily umami flavor. So when it’s time to quickly build a sauce, having a condiment around that instantly boosts umami is definitely a chef’s boon. In the past, this was often monosodium glutamate. But so many people are sensitive or allergic to this synthesized product, that chefs are now looking toward more natural compounds to boost savoriness in their sauces. My wonderful chef-partner Jennie Kelley gave me a very expensive umami paste for my birthday last year, called Taste No. 5. A combination of various natural ingredients like mushrooms, anchovies, etc., I used it with glee, primarily in tomato sauces, until it was gone. Since falling in love with Thai food after a dozen trips to Thailand, I’ve started using fish sauce (the standard condiment in Thai cuisine) in a variety of other cuisines to boost umami. I NEVER make an Italian tomato sauce without a healthy glug of fish sauce. “TRAITOR!” the Traditionalist may scream. But wait! The Italians have been adding anchovies and anchovy paste to their tomato sauces for centuries, and historic Italian recipes actually call for a primitive fish sauce their culture invented, entirely independently of Asian fish sauces, generations ago. And what is fish sauce made of? Anchovies. So my first instinct with Vegemite was to use it as an umami booster in recipes. And it works flawlessly. A spoonful in your fresh tomato sauce will blow your mind. A dab in a southern brown or white gravy will knock your socks off. Add it to meatloaf. To your mix of ground beef for burgers. Add it to your cream of mushroom soup, or your stock-based stews and sauces, and it will enlighten you. So what IS this miraculous creation, a modest addition of which dramatically improves the flavor of almost anything? It’s a byproduct of the beer-making process. The leftover yeast after beer is fermented is concentrated and mixed with salt, some vegetables (a trademark secret), wheat, and spices. It is potently nutritional…vegans use yeast extracts to supplement their diet with compounds they would normally only get from meat products. In fact, Vegemite has one of the densest sources of B-vitamins of any product on the planet. So while you may not be spreading Vegemite on buttered toast any time soon, if you love to cook, I guarantee you that you WILL love the way Vegemite improves the flavor of your cooking…it adds that little bit of depth, complexity, and savoriness that can be challenging and time consuming to build on your own. So give it a try! I doubt you’ll regret it. PLEASE leave your comments below! 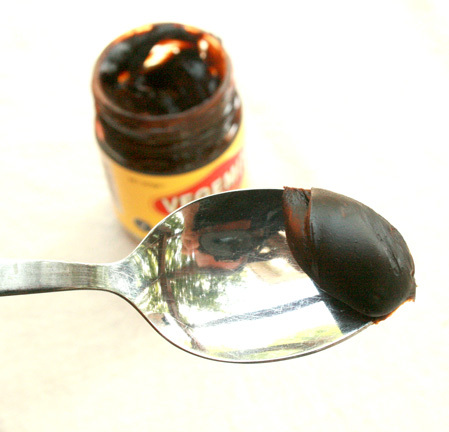 Let us know if you’ve tried Vegemite before and what you honestly thought of it. And also tell us if you’d be willing to give it a shot as a flavor enhancer in recipes, rather than just eating it on toast! This entry was posted in Blog and tagged #TasteMasterWA, Australia, Best Jobs in the World, caramelization, Maillard, Taste Master, umami, Vegemite, yeast. Bookmark the permalink. Yes, using Vegemite (or Marmite) in the recipes it will give you the umami results. By the way, the same as these brands you can find now in Brazil under the name of Cenovit, the same yeast extract. Enjoy cooking with yeast extract. Yes, you are spot on. We are raised on Vegemite from before we can remember. UMAMI ive never heard off but “your mummy” is definitely the source, in most cases. Soups, sauces, stock, good source of folic acid for pregnant mums too. Oldies make a soupy, stocky drink by adding hot water to a heaped spoonful, when theyre crook. If your run out of vegemite you have to make more beer, dont you? Goes without saying really. I live in Alabama (USA) and recently read an article about Marmite and Vegemite. Intrigued, I did a little research about the health benefits. I discovered that people seemed to like one or the other, so I ordered a jar of each from Amazon to do my own taste test. Frankly, I like both. I made Vegemite broth today since I am home sick with a cold, and it was very comforting on my sore throat. I’ve made scrambled eggs, adding a teaspoon to the raw eggs and whipping thoroughly. It’s now my daily breakfast. I eat limited carbs, so I haven’t spread either on toast, but I’ve spread on steaks for grilling. As soon as I’m over my cold, I’m going to try adding some to my homemade sugar-free chocolate candy.